Just How Social Will the E-book Be? Perhaps the last refuge from social media is the book, where many of us go to find shelter from the smoggy haze of status updates, tweets and comments hanging over our media lives. But as I discuss in my weekly analysis at GigaOM Pro, the solitary paradise known as the book is going social too, as companies such as Copia and BookGlutton look to wrap more social elements around the e-book and inject them inside ,as well. 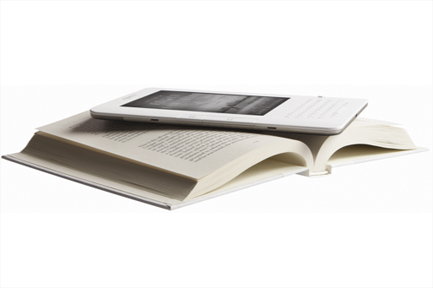 Copia, which demoed a line of e-readers at CES, offers a social e-reader platform that allows to readers to create their own page within the Copia community, connects to the popular Goodreads online book community, and allows readers to connect and exchange recommendations. While the company has already revamped it lineup of hardware (as have many since the release of the iPad and Kindle price drops), the Copia community is in public beta. BookGlutton takes social inside the book itself with a browser-based book platform that allows for in-book commenting and annotation, allows readers to see annotations from friends and like-minded readers, and even allows for in-book chats. I think this is only the beginning as book platforms will integrate more social e-book elements over time. Some potential social features we’ll likely see in e-books include multimedia annotations from your own social network, crowdsourced wikis linked within the book (to provide context and information around book elements), and in-book, location-based information about current and past readers of the books and their social commenting and interaction. I also predict many will resist the social e-book. Book reading in particular tends to be a solitary exercise, and I can see a passionate resistance to what some will view as an invasion of what I call the social smog to their e-book paradise. Not only that, but chances are, many poor early implementations of social e-books may turn some off to the idea, as seems to have been the case with some early social TV implementations. That said, there’s no doubt that more people will eventually embrace social reading. The college market will see the most enthusiastic early adoption, as social-media-savvy students look to collaborate, comment and even chat within their books as a way to help them engage more with the text and with their classmates. Today’s news about Inkling shows investors are thinking the same thing. Book clubs will also be natural fits for social reading, as the combination of enhanced e-books and social reading elements will find enthusiastic adoptees looking for ways to liven and enhance their literary get-togethers, be they in-person or through the social within the book itself. You may also be interested in attending our half-day GigaOM Pro bunker on August 25th, entitled “Author to Audience: Disintermediation in Publishing.” There are just a few tickets left for this free event, so register today. GigaOM Pro subscribers will be able to watch the livestream online and read the post-bunker analysis. I can see where this would be very helpful in work or school situations, but not so sure I want to see peoples comments in my fiction.